Its time for those 2019 resolutions and if health and fitness is at one of your resolutions then check out this guide to the ultimate home gym. 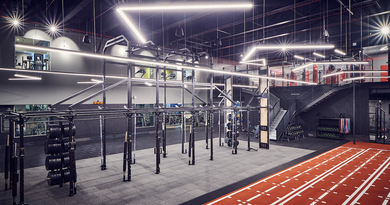 York Fitness understands that going to a traditional gym is not for everyone and have developed a large range of strength and fitness equipment that allows you to train from the convenience of your own home. Many now utilise personal trainers that can come out to train you at home on your kit. Whether you are starting from scratch or looking to add some new equipment to an existing home gym, our guide will give you the inspiration and help you need to achieve your fitness goals. An effective cardio workout can really get your heart and lungs working, helping to increase circulation, improve your metabolism, burn more calories and lose fat. Why waste time travelling to the gym or waiting for equipment when you can get straight into your cardio workout whenever best suits you. When starting out aim for 3 – 5 workouts per week, between 30 to 45 minutes per session. Once your fitness improves move into more advanced cardio training like HIIT, tempo or interval training. Whether you’re training for the sport you love, trying to get back into fitness or doing it for health reasons, York Fitness have a range of cardiovascular equipment designed to meet your needs. Treadmills offer a fantastic option for walking and running whatever the weather. Look for space saving folding versions like the York Fitness Active 110 or 120 that won’t dominate your home when not in use. Exercise bikes deliver a highly effective, low impact, cardiovascular workout and are great option when space is a premium. Upright cycles like the Active 110 or 120 are compact in design making them a popular option. Suitable for any room in the home. 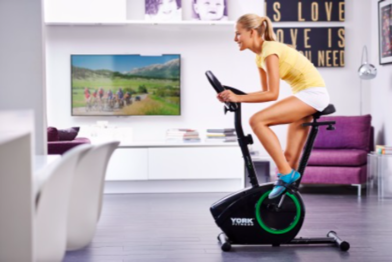 Cross Trainers like the York Fitness Active 120 deliver a truly versatile cardiovascular training option working both the legs and arms at the same time. 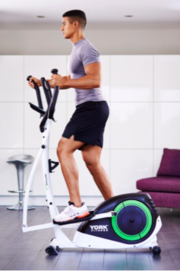 Also known as elliptical trainers they offer more of a total body workout compared to an exercise bike whilst offering a lower impact exercise option compared to a treadmill. Rowing machines are a great addition to any home gym and can help those looking to lose weight, develop muscle strength, enhance joint mobility, increase flexibility and improve endurance. 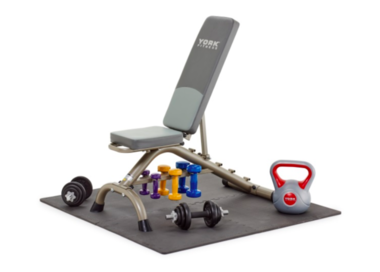 Machines like the York Fitness R301 fold away helping save space. 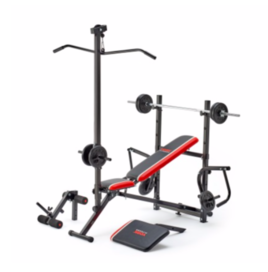 A quality weights bench is the foundation of any home gym and are essential for developing strength and providing a stable and comfortable platform for free weights and barbell workouts. Providing 5 backrest positons from flat to 90 degrees incline the versitile York Fitness bench is a perfect addition to any home gym. Ideal for performing dumbbell and body weight exercises. To get your upper body in shape as well as toning, strengthening and defining muscles you’re going to need a good set of weight plates and bars. 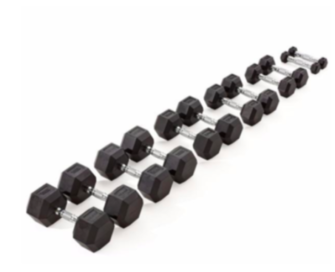 A great option is to purchase a barbell and dumbbell set which will provide a mix of weight plates that can work both the larger and smaller muscle groups. Available in either vinyl or cast iron the 25, 35 or 50 KG sets are perfect to combine with your chosen weights bench. Lifting dumbbells, also called free weights, are key to building upper body strength as they closely match the natural movements of your joints and muscles. 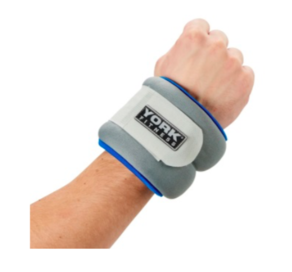 York Fitness Rubber Hex Dumbbells are available from 1.25 KG to 20 KG allowing you to develop your strength gradually. Adjustable sets where you can change the weight plates on the bar to your preferred load are also available in vinyl or cast iron options. Kettlebells can be a great alternative to a set of dumbbells. They are a total workout fitness tool, helping develop functional strength, power, endurance, core stability and balance. 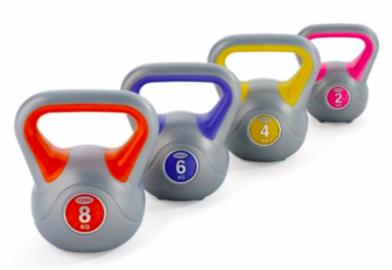 Available in vinyl or cast iron options Kettlebells can be swung, lifted and pushed, offering a comprehensive full body, fat burning workout. Boxing develops strength and cardiovascular fitness along with improving balance, coordination, reaction speeds and agility. 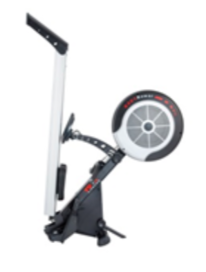 It compliments strength based training and can be easily added to your home gym set up. Adding boxing to home training can be as simple as hanging a punch bag in your garage and getting a quality pair of gloves. 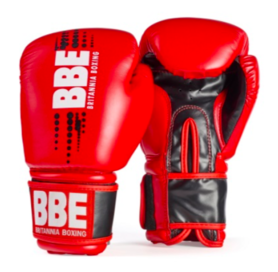 York Fitness has re-launched the famous Britannia Boxing Equipment range for 2018 which is aimed at both the home and club boxer.